As you know, WordPress is an incredibly popular CMS for a number of reasons. It’s free, open source, powerful, and it can be used for a wide variety of different purposes aside from a traditional blog or corporate website. One of the best ways to see that potential for flexibility is to take a look at the different types of themes that are available. You can find quality themes for all kinds of different purposes, which makes WordPress even more useful. In this article we’ll showcase 16 examples of niche WordPress themes. Here you’ll find themes for question and answer websites, job boards, crowdfunding sites, directories, deal sites, and much more. Hopefully it gives you some ideas of what is possible. Explorable, from Elegant Themes, is a location-based theme that pins your posts on a map. It is a great option for travel blogs, travel guides, and local business directories. It uses a responsive design and also includes functionality for user star ratings. You can get access to Explorable with a $69 membership to Elegant Themes (also includes access to more than 80 other themes). Breviter is an elegant, bold WordPress theme for creative bloggers and professionals. It’s based on clean, beautiful design and robust code. Plus, it’s free! InReview is also from Elegant Themes. With this theme you can easily set up your own review site. You can rate products, and the theme even includes affiliate integrated and custom widgets. You can get access to InReview with a $69 membership to Elegant Themes (also includes access to more than 80 other themes). 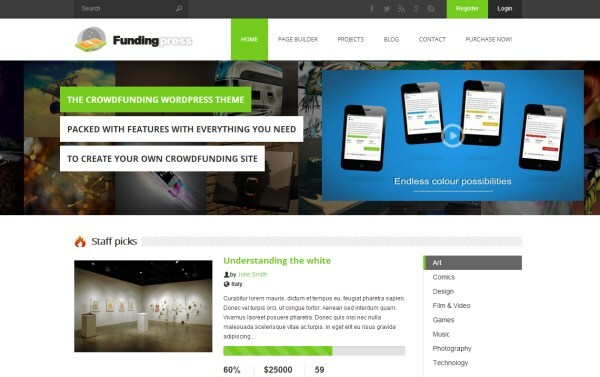 FundingPress, like Fundify, allows you to create your own crowdfunding website. Users can create their own projects, and other users can back them. It comes with a lot of features like unlimited colors and a theme options panel. You can purchase FundingPress at ThemeForest for $59. AskIt is another specialty theme from Elegant Themes. 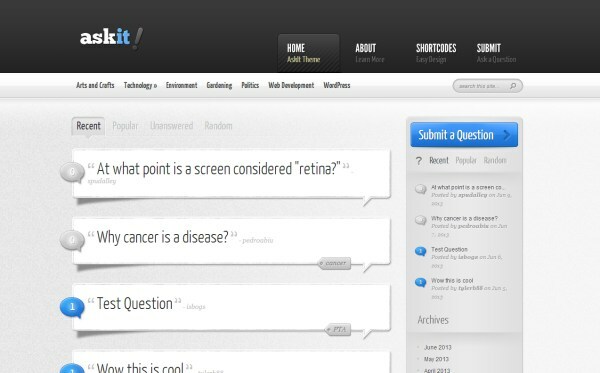 With AskIt you can create your own question and answer site very easily. Your site visitors can submit their questions, and other visitors can post answers to those questions. The user community can then vote on the best answer. You can get access to AskIt with a $69 membership to Elegant Themes (also includes access to more than 80 other themes). 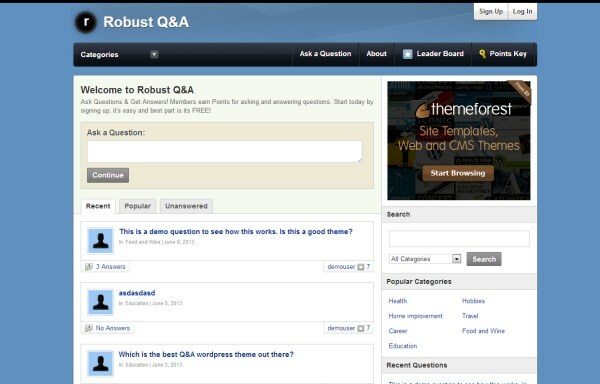 Robust Q&A is another question and answer theme. Users can submit questions and answers, and vote on the best answers. Visitors can comment on answers and like questions and answers. The theme is available at ThemeForest for $49. 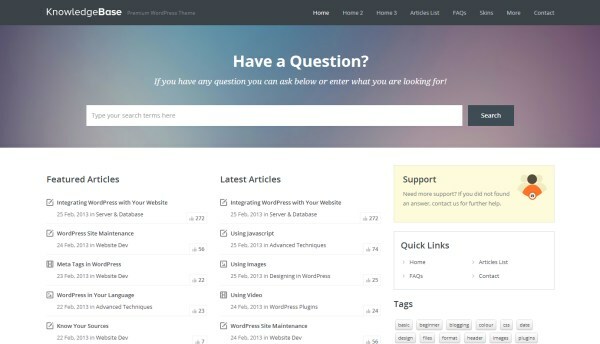 Q-and-A is a question and answer theme available at ThemeForest for a cost of $49. It includes the functionality for front end submissions of questions and answers, as well as voting for the best answers. 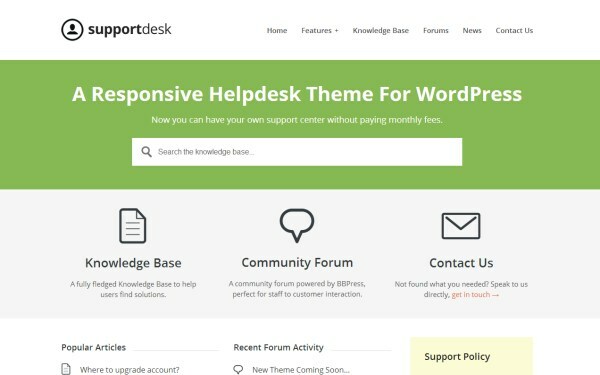 Support Desk is a responsive helpdesk theme for WordPress. It can be purchased for $59 at ThemeForest. It is a great option that allows you to quickly set up a support website for your product or service. It includes functionality for a knowledgebase, FAQ pages, BBPress integration, and more. 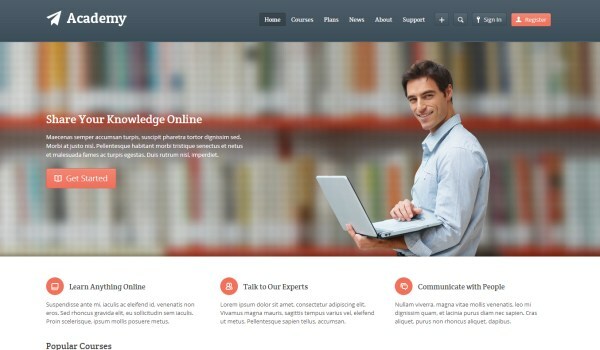 Knowledge Base is a responsive theme that makes it possible to set up your own wiki or knowledge base. It comes with features like 4 color skins, theme options, and multiple page templates. It is available for $59 at ThemeForest. 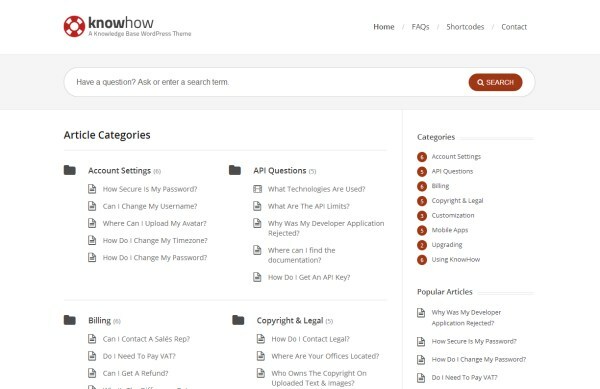 KnowHow is another theme for setting up a knowledgebase or wiki. It’s features include live search, FAQ pages, responsive design, and color options. You can buy KnowHow at ThemeForest for $49. Academy is a learning management theme that allows you to sell your knowledge, and it makes online learning and teaching possible. You can set up different courses and lessons and comes with loads of features, including WooCommerce integration. It can be purchased at ThemeForest for $59. 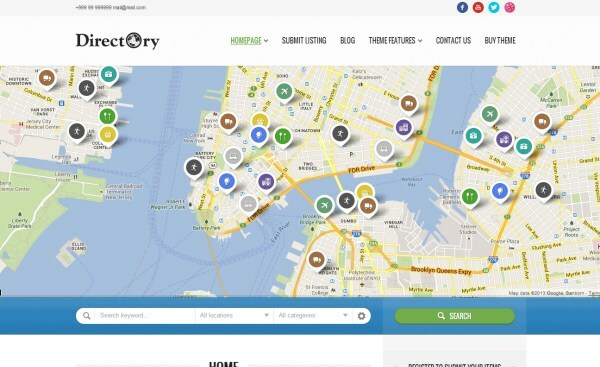 Directory Portal allows you to set up your own directory website on WordPress. It includes PayPal integration so you can make money from your directory site. The theme sells for $64 at ThemeForest. Domena is a unique theme that can be used when you are interested in selling a domain. 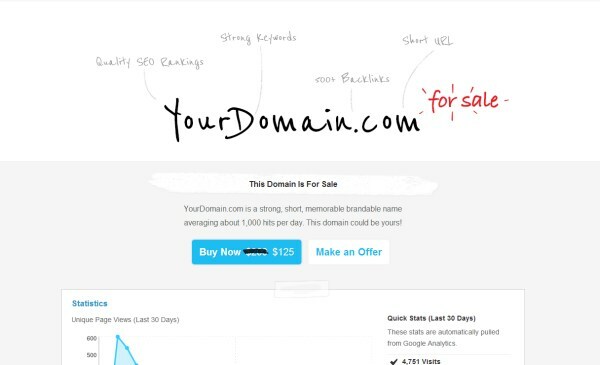 Let visitors know that the domain is for sale, and they can buy it now or make an offer. Domena can be purchased for $34 at ThemeForest. The Navigator is a location guide and blog theme. It is available at ThemeForest for $59 and includes features like Google Maps integration, full screen image backgrounds, and plenty of customization options. 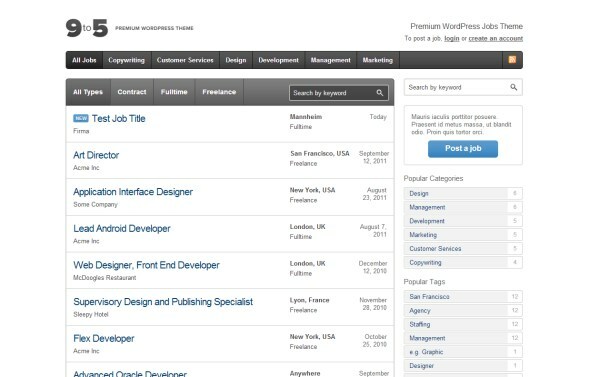 Nine to Five is a theme for setting up your own job board on WordPress. It includes PayPal integration, Google Maps integration, color and styling options, editable filter types, and more. It can be purchased for $44 at ThemeForest. Pinboard is a Pinterest-inspired blogging theme from Themify. It can be purchased for $79. 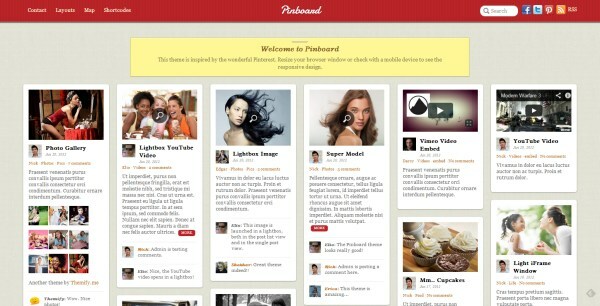 Pinboard’s features include a responsive auto-stacking layout, lightbox galleries, 7 theme skins, and more. 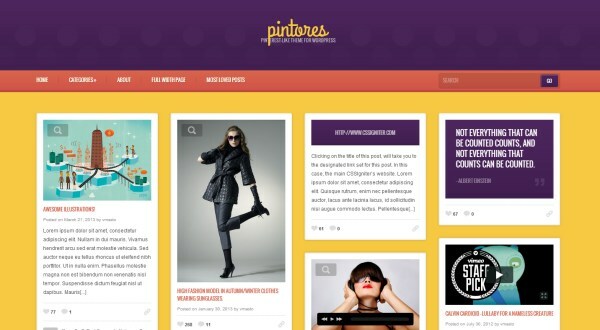 Pintores is a Pinterest-style theme from CSS Igniter. It uses a responsive layout and your visitors can mark items as favorites. You can get access to Pintores with a $79 membership at CSS Igniter (membership also provides you with access to more than 40 other themes.